"Since we’ve owned the Bark Blower we work much faster, not to mention we use much less material. The bark blower has been a great machine. 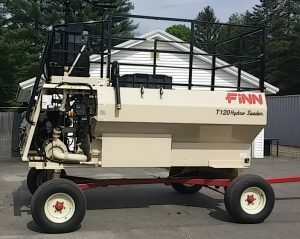 Its ease of operation and the quality of the completed work has eliminated the need for an experienced rake operator"
"The Finn Hydroseeder has allowed us to expand our services. Hydroseeding offers better results vs. conventional seeding for our customers which means less call backs. We have also learned that hydroseeding is much better than sod due to sods lack of drought tolerance." "At the season end I send my equipment to Hydrograss Corporation for service. I have been doing this for the past 7 years, every year, to ensure productivity and life of the equipment." "I am always confident in knowing that Hydrograss Corporation services my Finn equipment. It gives me great relief to know that my equipment will operate smoothly during the time I need it most. There was one year I didn’t send my equipment to Hydrograss for service and it cost me more in down time during my busy season than it would’ve to have had Hydrograss service it. I will never again miss another year. The spring season is short and my equipment has to run; Hydrograss, together with equipment durability, has helped me be successful during this time."